Found myself in the Miller section of Gary, with a couple hours to kill. 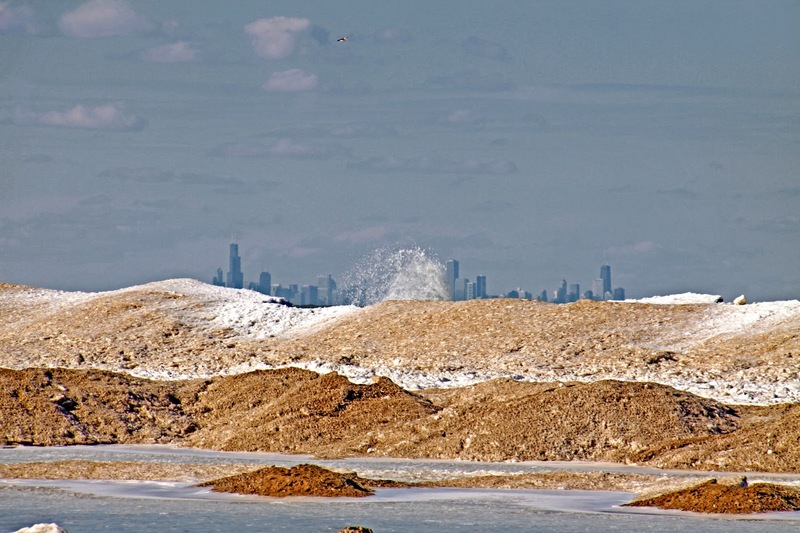 So I drove to the Lake St. Beach on Lake Michigan. West of the parking is another section of the Indiana Dunes National Shoreline. 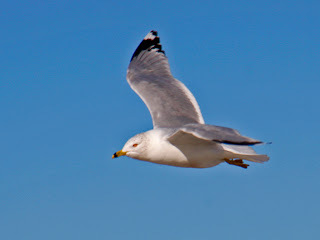 The weather was much nicer than last month's conditions during my scouting trip for fishing holes. 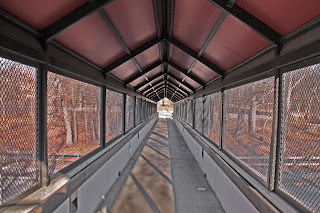 Temperature was close to thirty degrees and a mild wind. Walking the beach, in a westerly direction, between the lake and the foredune( the first dune on the beach). I encountered American beachgrass grow up the entire north slope of the dune. 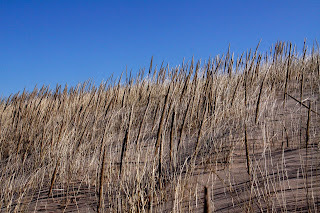 Beachgrass only grows on the foredune(first dune), where the sand is constantly shifting, its roots stabilizes the sand, aiding with the growth of the dune. 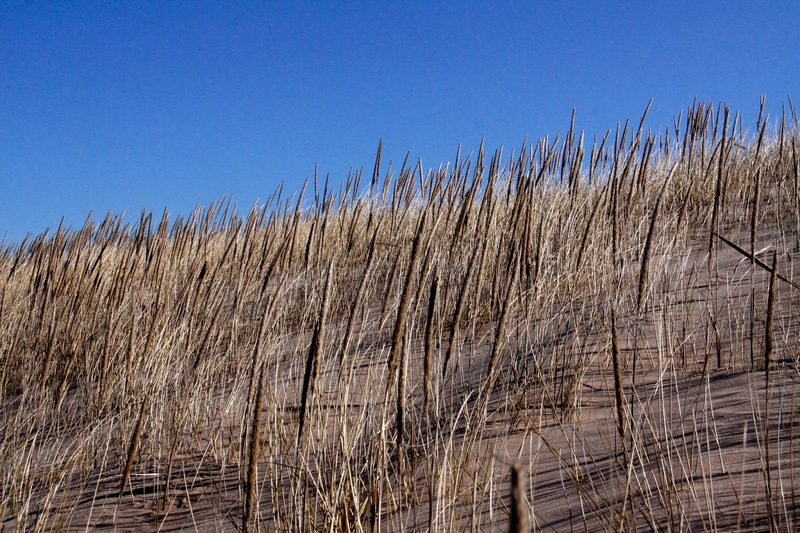 On the south face of the dune, where the sand is stable the beachgrass has a hard time growing. You can see a line on the backside of the dune where the beachgrass will not grow and it is replaced by other dune plants. Looking in a northwesterly direction, you can see how the dunes are formed or the process of dune formation as it is happening. Okay, what do you see, besides "Chicago on Ice". The Winds makes waves that carry sand ashore and pile the sand in the form of dunes. 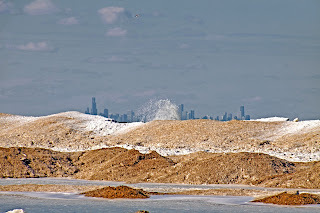 In time some of the sand will be blown inshore to replenish the dune and some will wash back into the lake forming underwater sand bars that create the dangerous rip currents that claim too many lives each summer. 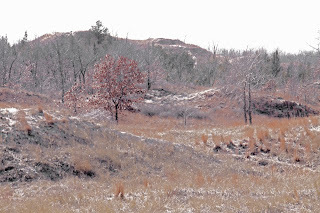 A view to the south, the high grounds are the dunes, the land between the dunes are called swales. The plant life changes as the distances from the lake increases. Grasses to shrubs and Pin Oaks to the large Pines, Oaks and Maples in the distances. Finished the dune walk. Pleasant weather but I forgot how hard a walk in the sifting sand dune can be for an old man. This walk will count for my early spring stress test. 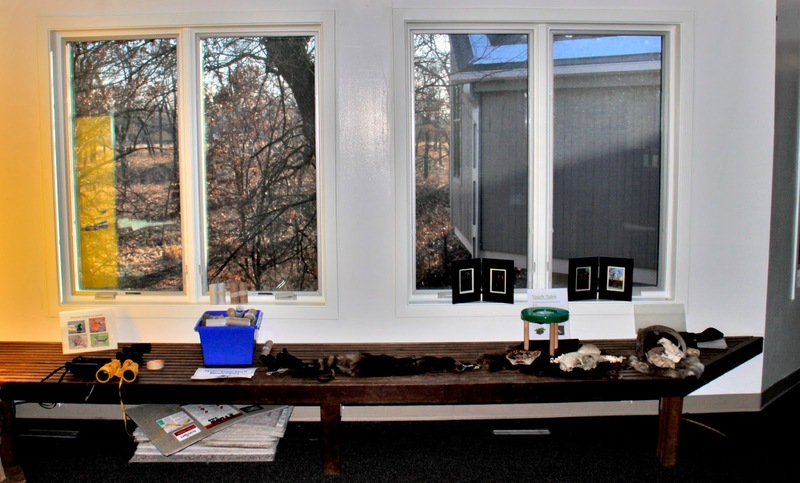 Had to stop at the Paul H. Douglas Center for Environmental Education. Maybe I can get a map of the National Lakeshore and directions to where I can find access to the Little Calumet River. I was in luck. The Center was open and I met two nice National Park Rangers. They gave me maps galore and let me take a couple pic. 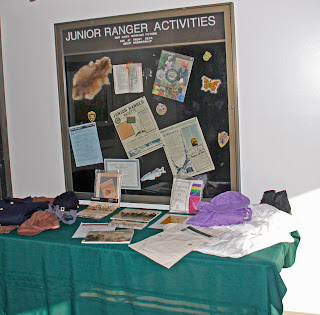 A display bench, holds some of the animal traces that can be found in the forest litter if you are observant while hiking the dunes. 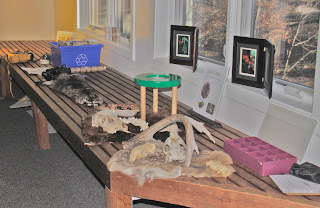 Here are animal skulls, deer antlers and animal skins. 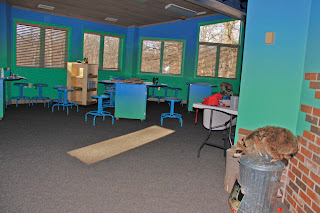 This is an activity room where environment education is taught. Remember keep the lids on your garbage cans, so we don't feed the animals. A neat Bio-Rama. 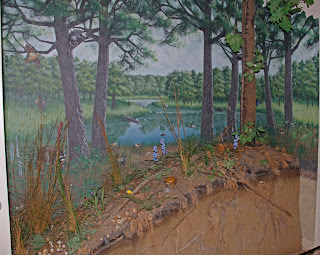 The mural depicts an overview of the wooded dune with a bog in the swale. The animals that inhabit the dune environment can be seen in the foreground of the painting. 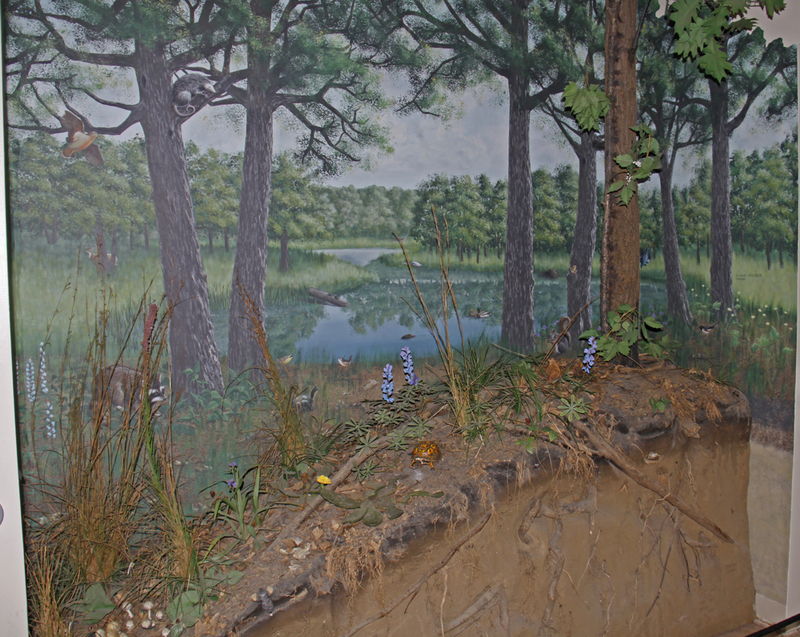 In front of the mural is a 3 dimensional replica of a cross-section of the forest floor and the soil below. Actual plants and leaf litter are collected from the woods to build the litter surface. 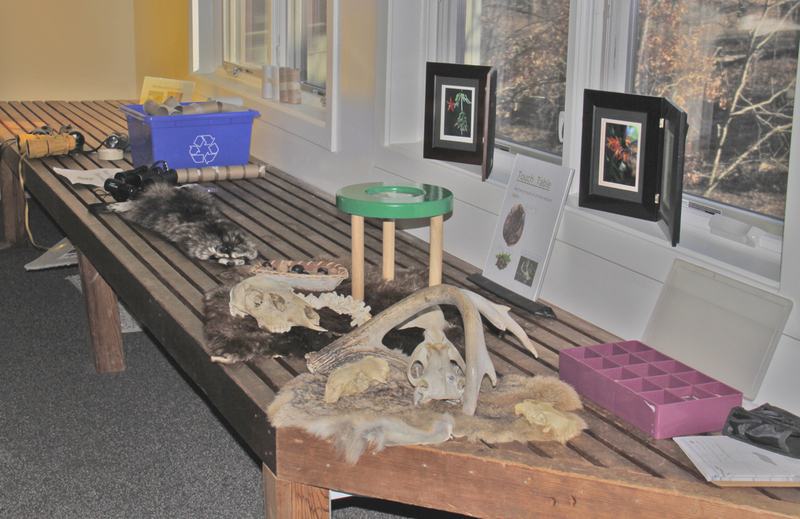 Replicas of the animals that live on the forest floor are in place to show the zones in which they live. Under the litter layer is the dark rich top soil where the plants set their roots and most small animals live. All of the above rests on top of the sand that formed the dunes. Look closely and you can see the mole and gopher tunnels and tree roots that mix and aerate the soils.